Improved performance of anchoring systems and subsea foundations will be unlocked by this project, through an improved understanding of the changing seabed properties through the life of the facility, and through better consideration of soil-structure interaction and whole life system behaviour. 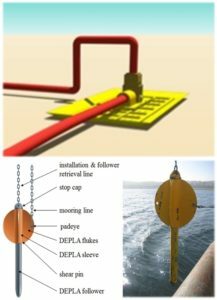 Novel anchors such as the UWA-developed dynamically-installed plates offer considerable cost savings on a standard mooring anchor spread. They could also benefit from changing strength conditions over time following cycles of sub-extreme anchor load conditions. Also, the slow cyclic loading experienced by subsea structures connected to flow lines and jumpers causes a similar effect. The subsea structural size is driven by the current paradigm of a fixed foundation resisting loads at code-defined safety factors, which is appropriate for load-controlled environmental actions but is overly cautious for loads caused by thermal expansions or connector misalignment. A radical alternative is to allow significant but tolerable foundation mobility resulting in a reduction in foundation size, fabrication and overall installation costs. The aim of this project is to develop low-cost low-risk anchors and subsea foundation solutions which take benefit from considering the whole life behaviour.